The morning didn’t go too well for a man who decided to use a fake gun to rob a store and was shot in the neck by a store clerk before he fled the business. The incident occurred around 2:25 a.m. at the Beacon Store, 1101 W. Cervantes Street. A store clerk told police he shot the suspect during the robbery. The clerk – Abed Alslaq, 20, of Pensacola – said the suspect entered the store wearing camouflage, a hat and a bandana over his face. The clerk said he told the suspect to remove the bandana but he refused. During the robbery, the suspect went behind the counter, pulled out a pistol and pointed it at the clerk, who believed it was real. The armed robber managed to get some cash and 10 cartons of cigarettes before he fled the business. 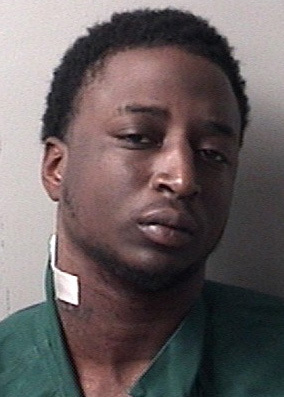 The suspect – Jarell Blackmon, 24, of the 7900 block of Beaber Road, Pensacola – was later seen in the area of E and Gadsden streets by Officer Matthew Mercado. Blackmon, who was bleeding from his neck, fled from Mercado despite being ordered to stop. Officers set up a perimeter and Officer Patrick Kelly and his K-9 did a track. Blackmon was found hiding in the 600 block of North E Street. He was taken to a hospital for treatment of a gunshot wound that entered and exited his neck. Blackmon was charged with armed robbery, grand theft, public order crime (wearing a mask or hood during commission of a felony), possession of a firearm by a convicted felon, and resisting without violence. Blackmon told police the firearm he used was fake. No charges have been filed on Alslaq. I worked as a cashier at a gas station in Cantonment,my employer prohibited its employees from having a gun on the premises. I never understood that because if there ever was a place that a gun might come in handy I’d think it would be a gas station. This would be robber thought it was a real gun he had ’til he saw the real thing! If more business owners/employees would follow this example, then some criminals might reconsider making stupid decisions like Jarrell did. Jarrell, your very fortunate to have a second chance here, I suggest you head this warning. It cannot be too difficult to make a realistic-looking fake gun. It just goes to show you that even if we _could_ keep most criminals from getting real guns it would not solve the problem of violent crime. We would still need our own real ones. “and are relying on this gentleman’s word. Having admitted he presented something as a weapon in the robbery, he has confessed to armed robbery. The weapon doesn’t have to be loaded and functional or even more than a pointed finger in the pocket. The threat made it qualify. Even passing a note claiming to be armed and demanding money of other things of value qualifies. Evidently while the criminal was fronting, the clerk was not. Too bad the clerk had to rush his shot. Wannabe a thug then sometimes you pay the price. All these charges against an already convicted felon, regardless of the fake gun warrants this one a one way ride to prison for hopefully 25 to 40 years. Same story we hear time and time again – convicted felons out on the street committing more crimes…put him away. If his gun had been real, the clerk might be dead. Kudos to the clerk for fighting back. Serves notice to all the creeps in the area. I like the way he made sure to hold his head just right so that he could show off his boo boo. Probably wanted to make sure his mama would feel sorry for him. With all of the important things located in your neck like your jugular, carotid, esophagus, trachea and spine, somehow a bullet could go straight through without any damage. Amazing. Too bad the clerk wasn’t more accurate. This needs to happen more often and maybe thugs will go back to robbing and killing each other instead of innocent citizens. Perfect chance for some genetic cleansing……. YES, 2 more inches to the right and only HISTORY not HIS STORY–How did you like that play on words. Yes I know he is some ones son maybe a father but thugs like this need to be stopped on the spot with no MAN HUNT and taken on to the morgue and put on public display not having to waste taxpayers money housing and feeding him then a public defender then on to prison and more expense for how ever many years but with him locked up is better than out amongst the honest working people creating havoc, fear, terror, robbery and whatever else. Exactly, and the articles sound like the PPD did not actually recover the “fake” gun and are relying on this gentleman’s word. So, if there is no weapon found will this be a tough case to prosecute? A guns a gun in my opinion. That idiot is so dumb he really thinks it matters it was a fake gun. Pull a gun on Someone be prepare to be killed people aren’t playing with scum of the earth anymore. It makes me mad that the clerk didn’t shoot him between the eyes, because if you shoot do it to kill. Sure do hope it didnt mess up that neck Tattoo. And you know that’s true because dishonest people never lie. Regardless, stealing cigarettes is bad for your health — cancer, you know. If the aim was 2 more inches to the right, this story would have had a happy ending.